Keep your water free of chlorine and sediments with reverse osmosis systems and water filters, including the brand HydroLogic. The Stealth RO is a reverse osmosis water filter that is capable of reducing 98%+ of chlorine and contaminants such as odours, chemicals and sediments. The GroGreen Garden Hose Filter is compact and eco-friendly, uses a custom blend of green coconut carbon and KDF55 media, and will help to improve the quality of your fruits, vegetables and flowers. The filter works to eliminate harmful chlorine and greatly reduces the amount of chloramines found in your water. The BIGboy is an extra high capacity de-chlorinator and sediment filter and can be set up as either a whole house or standalone filter. 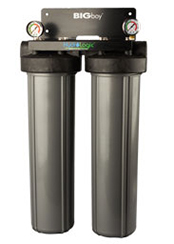 The TALLBoy filter unit is rated at up to 99% chlorine removal @ 2GPM flow, and can clean up to 90% of the sediment particles above 5 microns. The TALLBoy produces up to 120 gallons per hour of clear water. 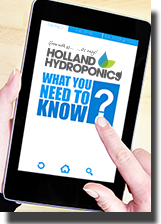 The HydroLogic smallBoy is a de-chlorinator and sediment filter, designed to be used as a standalone. It has been rated at 99% chlorine removal @ 1 GPM flow, and can clean up to 90% of the sediment, rust, silt etc in your water. Note, this filter is not designed to lower the ppm of your water.